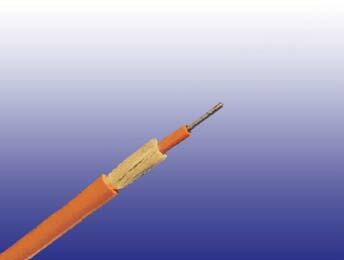 This cable is characterized by light weight and small diameter, suitable for both aerial and duct installation. The cable can also be used for direct burial for armoured option. 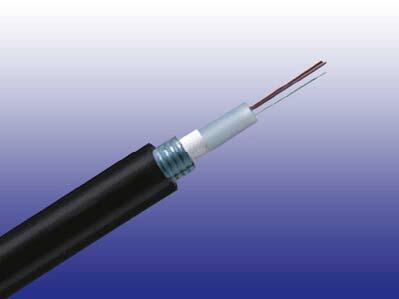 Central loose tube cable contains one tube with 2 - 24 fibers, which is filled with water blocking gel. 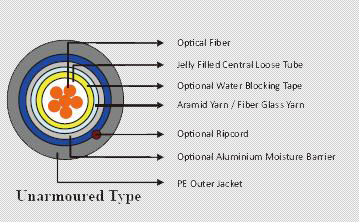 Either aramid yarn or fiber glass is wound around the tube to provide physical protection and tensile strength. 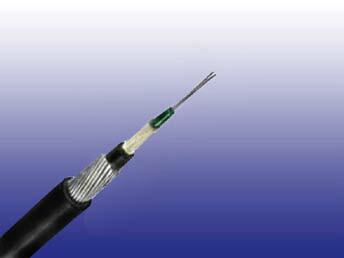 The cable can be jacketed with either PE or LSZH. PE is the preferred option in outdoor environment for water protection purpose. 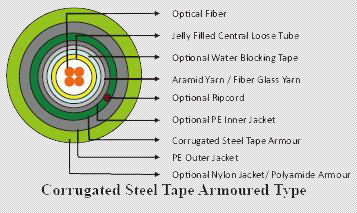 For direct burial, either steel wire armour or corrugated steel tape armour is applied with an optional inner jacket of either PVC, PE or LSZH. An Aluminium moisture tape can be incorporated under the jacket for water blocking and shielding purpose. A ripcord is located under the jacket to facilitate jacket removal. 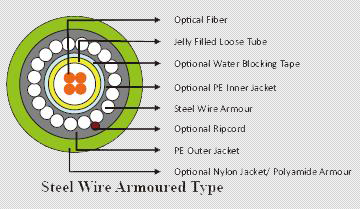 20×OD for armoured cables Cyclic Flexing: 25 cycles for armoured cables. Temperature Range: 100 cycles for unarmoured cables. Colored coded fibers and binders for quick and easy identification during installation.